The voice was at the centre of Brahms's music. At its beginning and end, too. Of the first seven completed works he allowed into the public domain, three, significantly, were sets of songs. His last composition, the Vier ernste Gesänge ('Four Serious Songs'), was also to be for voice. The preoccupation with song was ever present, always crucial, occasionally defining; the voice perpetually exploited and explored in more than 200 songs for solo voice, duet and solo quartet, and in a myriad of works for accompanied and a cappella choir, the volume of which it is impossible to do justice to in a single article. Suffice to say that the sense of the sung voice was instinctive and integral to Brahms's own sense of himself as both man and musician. 'The ideal', he once remarked, 'is the folk-song.' He might well have added, 'and the voice that creates it, the sublime'. More than the symphonies and the chamber music, it is the vocal music that most explicitly reveals the head and heart of a composer whose true, full and complex identity has been obscured by time and reputation. Where the autobiographical subtext of his instrumental music was frequently disguised, habitually denied, the provocation and purpose of the vocal music is often gloriously, unashamedly, immediately apparent. It is a repertoire that is honest, direct and intellectually unfettered. Unequal, too, it has to be said, in terms of quality. Yet, in a curious way, it is those obvious occasional weaknesses that give the whole its strength, make it so tantalizing, so endearing, so much more truthful and reliable an expression of the man who composed them. Punctuating the life and career as they do, the compositions for voice provide a revealing series of thumbnail portraits of Brahms that belie the lingering image of him as being ill-equipped or disinclined to deal with the complex reality of his own emotional responses to the people and events that impinged upon his life. Certainly, for pianist Graham Johnson, the Lieder provide for an altogether fresh and vital perspective on the composer. 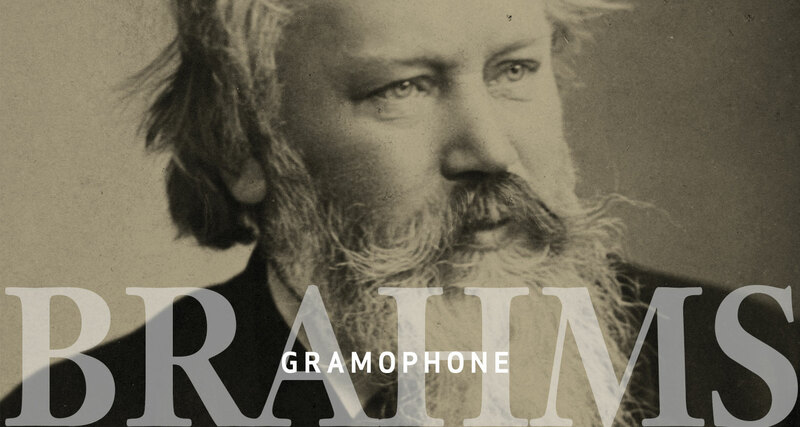 The early songs may not be anchored in actual, lived experience but they clearly connect with the rich emotional imagination of the young Brahms. Liebestreu (Op 3 No 1), with its tragic E flat minor key signature, the lyrically tender Wie die Wolke (Op 6 No 5), the unapologetically melodramatic Treue Liebe (Op 7 No 1) and the troubled rather than tortured Nachtigallen schwingen (Op 6 No 6) all point to the burgeoning sense of emotional dislocation that was to affiict him throughout his life. Each new song represented a further step along the journey that was, in Graham Johnson's opinion, 'to take the Lied back to Vienna for the first time since Schubert's death'. Self-evident in the two other sets of songs that appeared in the 1850s the Eight Songs and Romances, Op 14, and the Five Poems, Op 19 - were the many influences acting upon the young composer: Schubert and Schumann of course, but also Mendelssohn and Robert Franz and the highly coloured idioms of traditional folk-songs and tunes. However, derivative though Brahms's early songs may have been in some respects, there were original elements to be found in them, and innovations just around the corner. Graham Johnson again: 'What he did which Schubert never did, was to show an interest in folk-song. That is certainly the thing that separates him from almost all the other great Lieder composers. Schumann had shown the beginnings of an interest, Wolf wasn't interested at all, and Schubert had had the talent to write his own folk-songs if he so wished. Brahms developed a quasi-scholastic but largely romanticized attitude to folk-song. He made his own liberal adjustments to Zuccalmaglio's 'traditional' songs (Op 14 Nos 6-8] and in his own folk-song sets [most conspicuously the Zigeunerlieder] he actually composed original things and passed them off as traditional. It wasn't yet the age of Kodály and Bartók!' But even in early Brahms there is more to be found than merely musical sleight of hand. It's that enigma, that incessant emotional dyspepsia deep within the songs that has made Brahms so unpalatable for so many for most of the present century. Françoise Sagan's inquiry 'Aimez-vous Brahms?' may seem less provocative, less controversial now, but there remains a lingering, overly cautious suspicion, a fact Graham Johnson is keenly aware of. The daunting scale and scope of the two Liebeslieder collections 33 songs for SATB and four-hand piano (Opp 52 and 65) - may aspire to the condition of a song-cycle, but they are atypical and do so by default rather than design, Brahms preferring to work on the considerably more intimate level of private expressions of grief than public displays of grieving suggested by the extended song-cycle. If his own circumstances coloured that preference, so too did his reluctance to step deliberately into Schubert's shadow. The only comparable analogue in Brahms is the mighty Ein deutsches Requiem. Published in 1868 some 11 years after it was first begun, it also employed baroque devices and married, too, that blend of the sacred and the secular peculiar to Brahms which exalted love, and elevated it, in his eyes at least, to be the highest and holiest of virtues. There were other large -scale choral pieces deserving of mention, each of varying degrees of success. The Triumphlied, Op 59, his jingoistic paean of praise to Wilhelmine prowess; the classically inspired Nänie, Op 82, with its Brahmsian lyric par excellence - 'Even the beautiful die. Yet to be a song of lament in the mouth of a friend is glorious' - and Rinaldo, the flawed dramatic cantata which employed the same instrumentation as the Alto Rhapsody and which made first use of a male chorus, are the three that most demand attention. But it's a measure of the neglect that Brahms has endured and continues to suffer that even deep into the present century it was possible for all of the interviewees for this article to confess to variations on the theme of, as one actually said, 'Never heard it; never played it;' for all of these works and considerably more. In a very real sense, then, the nineteenth century didn't end when Brahms finally set down his pen in 1897, but rather at the moment he first picked it up some 50 or so years earlier. In deliberately refusing the entreaties of Liszt and Wagner's insurgent Weimar School, and in just as consciously stepping away from the inheritances of Beethoven and Schubert, Brahms stepped into territory which was largely uncharted and in which, for most of his life, he was the sole dweller. But if Brahms didn't belong in his own time, and if our present age has found it difficult to accommodate the full magnitude of his achievements, what does the future hold for him? Are we to add to Anton Rubinstein's much quoted catalogue of his apparent failings - 'Insufficiently at ease for the salon; insufficiently fiery for the concert-hall; not rough enough for life in the country; for life in the city not sophisticated enough' - the accusation that for posterity he was - is - insufficient in some other and equally spurious but unforgiving way?